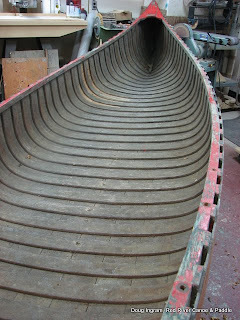 So, while the fine weather was holding out, I decided to work ahead and strip out some more canoes. Working out of doors and using the pressure washer made this task almost pleasant. These are the "before" shots. So I stripped out this old Peterborough high end Champlain. 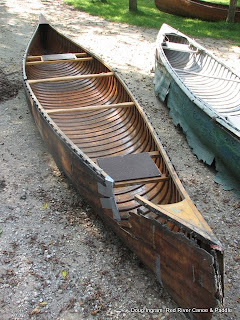 This is a special canoe, the planking is perfect, you rarely see that. 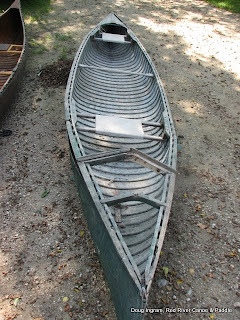 And this Peterborough low end Champlain. This one is from Pioneer camp, and is my next project. And this rare Peterborough Dart. This one is mine, and its a wreck, but its so rare that it is worth the effort. Three different colour coats of paint over the varnish to get off before I can do anything else, but if I don't at least start now it is too easy to keep putting off. Posted by Doug Ingram at 9:09 a.m.